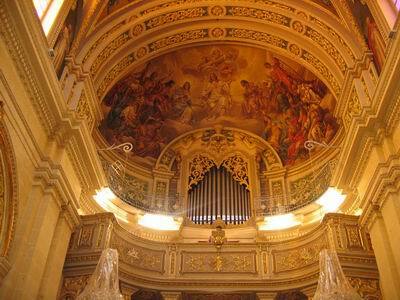 The organ in Fontana Parish Church, Gozo, was built by the Sicilian firm Laudani e Giudici of Palermo in 1908. The organ, situated above the main entrance to the church is enclosed in a case formed by stone walls on either side and at the back. The front part is enclosed by glass espression shutters. The façade pipes (of the Principale 8') are unenclosed. The substantial wear-and-tear present before Robert Buhagiar’s restoration confirmed that the organ was much in use during its 90 years of existence. During this period it had never been completely restored but only maintained and ‘patched up’ as required to keep it going. However it had deteriorated so much that it had been unplayable for a few years prior to Buhagiar’s restoration. Full restoration work on the organ started in 2002 and the organ was completely dismantled and transferred to Mr.Buhagiar’s workshop in Zabbar. Here all parts were carefully restored to original condition using reversible processes and original materials as much as possible. Parts like the 2 main spring chests (one for the treble and one for the bass), 2 pedal chests, parallel bellows with two feeders, keyboard, pedalboard, action rollerboards and other parts were meticulously restored. Unfortunately woodworm had caused great damage to the front part of the bass spring chest and this part required full reconstruction. Once the organ case was cleaned the restored organ parts were returned to the church and re-assembled. The organ was then voiced respecting the original voicing characteristics and tuned in equal temperament. It has a total of 714 pipes and it is very interesting to note how the various stops add colour and brightness rather than sheer volume. This interesting voicing characteristic is present in all stops, from the soft Bordone 8’ to the Tromba 8’ and Ripieno). The original voicer might have worked this way considering the relatively small size of the church. The mechanical action is by design not very precise but the organ possesses a beautiful and expressive romantic tone relative to the size of the church. Fontana is one of the smallest villages in the island of Gozo The church's foundation stone was laid on 29 January 1893. It was dedicated to the Sacred Heart of Jesus on 29 January 1905 by Bishop Giovanni Maria Camilleri. The main altarpiece, showing the Most Sacred Heart of Jesus, was crowned with a golden crown on 18 June 1993, by Bishop Nicholas J. Cauchi, on the occasion of the first centenary of the laying of the church's foundation stone. The main altarpiece is part of Giuseppe Calì's works. The Fontana parish was established March 27, 1911 by Bishop Giovanni Maria Camilleri.